Confirmation joy: (Left)Archbishop Mark Coleridge celebrates with those confirmed recently at Sacred Heart Parish, Booval. LOVE and community is at the core of Booval’s Sacred Heart primary school’s new facility – the Amare Centre. The centre’s name is taken from the school’s motto, “Amare est Servire” – “to love is to serve”. Members of the school and parish community agreed the centre should be named in honour of the love shown by the Sacred Heart of Jesus. Bishop Joseph Oudeman officially opened and blessed the centre at the school on November 1. He said the Amare Centre was “a magnificent venue for community celebrations”. Sacred Heart principal Brendan Creevey said the Amare Centre was a facility for the entire surrounding Catholic community. “We see it not as a school hall, but a Sacred Heart Hall,” Mr Creevey said. He extended the invitation for Sacred Heart priest-in-charge Fr Bob Harwood to have total access the centre. Under the Building the Education Revolution Federal Scheme of 2010, the school was able to fund the exterior of the centre. But the school and parish community made a combined effort to fund the $300,000 interior furnishings. 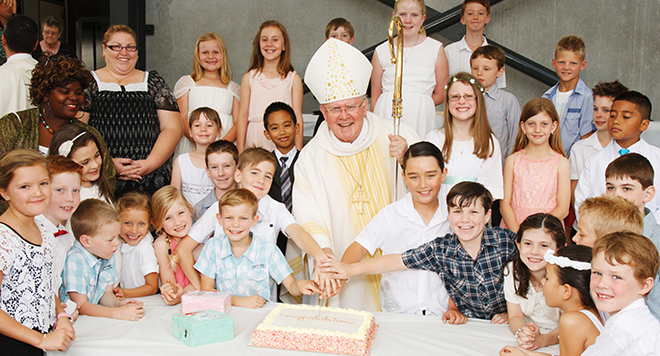 Booval parish also celebrated the Sac-rament of Confirmation for 34 children and two adults at the Amare Centre on October 27, with Brisbane Archbishop Mark Coleridge officiating.